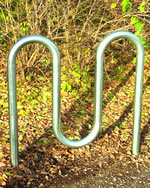 Bike racks for your playground, school, or organization are available here, from the top manufacturers in the business. These bike racks are tough, classic models from top suppliers in the bike business, with some new twists thrown in (see below). Don’t settle for a flimsy bike rack — get the quality models your students or employees expect, to keep their bikes safe. 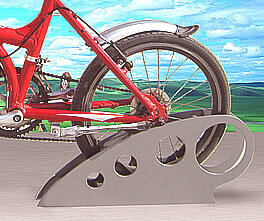 Portable or permanent bike rack models are available for every photo you see here. Each bike rack conforms to playground standards, and once a bike is fastened to them, it’s not going anywhere. You can rely on Maryland Materials to provide you the quality playground equipment that gives you peace of mind and strength of security. This space-age bike rack is designed for single bikes. Each unit attaches to the ground with two vertical bolts. 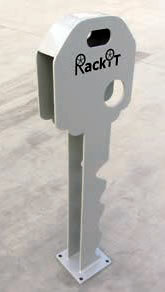 The RackIt is made from galvanized steel, powder-coated in the color silver. The RackIt is great for grouping — you can arrange them in any configuration you like, giving multiple cyclists a place to store their ride. For more information, phone us today! 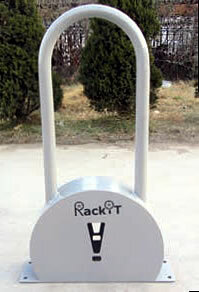 RackIt Bike Rack. Weight: 22 lbs. each. Dimensions: 27″ x 11″ x 3-1/2″. Note: Bolts not included. 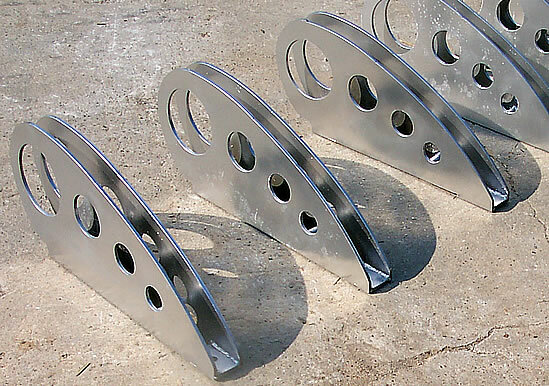 We recommend wedge anchor bolts (stainless steel or galvanized), 3″ – 3-1/4″ length, 1/2″ diameter. NEW! Bike Rack in Lock Design! oversize lock theme to your area. NEW! Bike Rack Key Design! size key is fun for bike users. These racks are the schoolyard standard. The frame is built of 1-5/8″ O.D. pipe. The racks are available in portable or permanent models. 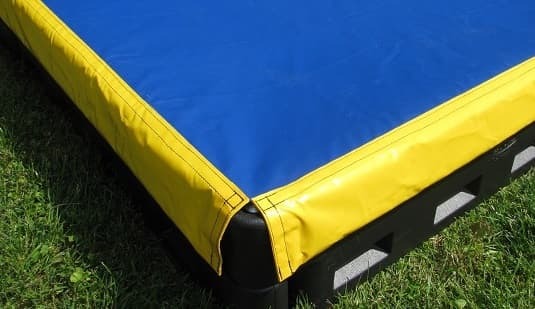 Order the 5′ models on-line by clicking below.Available lengths: 5 feet, 10 feet, or 20 feet. All measure 2’8″ wide x 2′ 9″ high. The 5-foot bikeracks ship UPS. 5 Feet Long 9 bicycles 65 lbs. 10 Feet Long 18 bicycles 110 lbs. 20 Feet Long 36 bicycles 215 lbs. These classic designs have smaller racks for fewer bikes. Available to attach 5, 9, or 18 bikes, depending on the size of frame you choose. The frame is built of 1-5/8″ O.D. pipe. Available in portable or permanent models. The 5-foot bikeracks ship UPS! 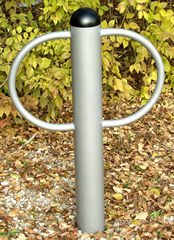 These modern bike racks are available with 7 loops or 5. Available in permanent models, which must be embedded in concrete, or portable models, which bolt to the ground using a surface mount. Also available in a 2-loop configuration (see “M”-Shape Rack at the bottom of the page). 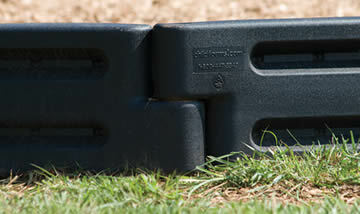 These racks are perfect for parks, trails, and smaller playgrounds. They’re easy to install, and dent-resistant, too. 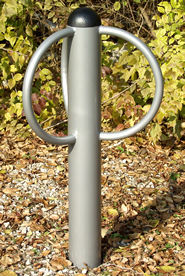 These bike racks are available with a powder-coated paint option (the finish is matte, not shiny). These bike racks ship via UPS. Optional Surface MountThis feature lets you bolt the bike rack to the ground. May be ordered with any of the Mini Bike Racks shown in this section. 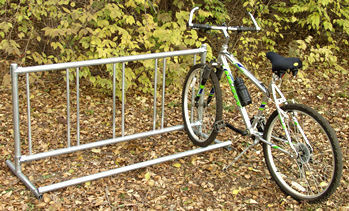 Price: Approximately $13.00 – $16.00 for each bike rack. If you have any questions about the bike racks, call us TOLL FREE.